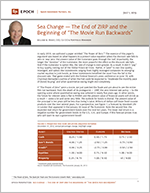 Sea Change — The End of ZIRP and the Beginning of “The Movie Run Backwards” - Epoch Investment Partners, Inc. In early 2010, we authored a paper entitled “The Power of Zero.”1 The essence of this paper’s argument was based on what happens to a present value equation when the discount rate falls to zero or near zero: the present value of the numerator goes through the roof. Importantly, the longer the “duration” of the numerator, the more powerful the effect as the discount rate falls. And if the numerator is option-like, the rate of change is even greater. As a result, it didn’t “pay” to buy quality coming out of the Global Financial Crisis. Rather, it “paid” to own low-quality, leveraged, and option-like investments ranging from highly leveraged companies to emerging market equities to junk bonds, as these investments benefited the most from the fall in the discount rate. That game ended with the Federal Reserve’s press conference on June 19, with Chairman Bernanke’s outline of when the Fed could be expected to “moderate the monthly pace of [bond] buying” and when quantitative easing might end completely. If “The Power of Zero” were a movie, we just watched the finale and are about to see the entire film run backward, from the death of its protagonist — ZIRP, the zero interest rate policy — to the opening scene where quantitative easing was ushered in nearly five years ago. In other words, the future for interest rates is flat to RISING and the present value of financial assets will shrink as a result — some a lot and some very little. The outlook for bonds is dismal. The present value of the principal in ten years will be less than today’s value. Billions of dollars will leave fixed-income products over the next several years. For a perspective, see Figure 1, a forecast by Standard Life in London that appeared in the January 26 issue of The Economist. Note the second line: the expected real return for government bonds over the next ten years. The mean real return is a negative number for government bonds in the U.S., U.K., and Europe. If this forecast proves true, who will want to own a government bond? Source: Standard Life Investments, The Economist. January 26, 2013. Equities, in the short run at least, will be affected as well. Figure 2 shows that price-to-earnings ratios for the S&P 500 have risen from just over 11 in early 2012 to nearly 15 at the end of May 2013. As QE removed the tail risk of illiquidity, P/E ratios expanded sharply. Source: Standard & Poors, Yardini Research, Epoch Investment Partners. June 2013. Figure 3 illustrates this point from another angle. On a rolling 12-month basis, over 85% of the companies comprising the S&P 500 Index were near 12-month highs at the end of May, 2013: the highest percentage in 20 years. Any negative event, let alone the comments by Bernanke, could have triggered a short-term stock market correction in our view. Bernanke’s comments signal a sea change. It is the end of QE, conceptually if not tactically. It raises the discount rate for all financial assets. It is the start of watching the movie of the past five years run backwards. Beginning with the AIG and Lehman crises in 2008, central banks in the G7 countries have provided “free” money to banks and the financial system. This has allowed the mother of all carry trades as financial institutions front ran the public forecasts of the central bankers. Just look at the yield and credit quality spread during the nearly five-year period (Figure 4). Leverage via the carry trade will now begin to unwind. Exposure to bonds and structurally weak companies will be dialed down. If central banks begin to shrink their balance sheets, liquidity will contract. During the early part of the second quarter, data suggest the banking systems of the U.S. and Japan shrunk their balance sheets more than the central banks created liquidity — hence a negative liquidity event. The ECB has also been selling bonds over this period. As a result, the structurally weakest borrowers will suffer. This will include economies running large current account deficits, particularly those who depend on foreign capital to fund those deficits. See Figure 5 for examples. These countries will suffer weaker currencies, restrictive fiscal policies, tighter monetary policies, rising interest rates, capital outflows and slowing growth. The virtuous cycle in emerging markets will become a vicious cycle for those with the characteristics listed above. Overall, final demand is still slowing in aggregate. China’s growth rate is declining from 7%-8% to somewhere around 5%-6%. Other emerging Asian economies, most of which have current account surpluses, have already slowed, including Singapore, Korea and Taiwan. The euro zone is mired in recession and likely to stay there. The U.S. is growing, but at a lackluster 1%-2%. Japan has the potential to be a positive surprise, and we will examine that country in a subsequent paper. For the time being, its currency devaluations will steal growth from its trading partners, resulting in economic expansion. Most of the money printed by the central banks has not found its way in any meaningful fashion into the real economy. Rather, for the most part, it has become a means for financial arbitrage. The average person has not seen after-tax income rise much at all over the past several years. Inflation is just not a worry. A debt deflation bomb still hangs over the global economy. Poor demographics in the developed world outside the U.S., large debt-to-GDP ratios of the G7 (see Figure 6), and the threat of rising taxes combined with the aforementioned dismal real income growth create deflationary pressures. This deflationary condition still exists despite the largest stimulus ever provided by policy makers. Source: International Monetary Fund, World Economic Outlook Database, Epoch Investment Partners. December 2012. If QE is ending, the balance sheets of the banking and shadow banking systems will shrink at the margin. If this occurs, the weakest link will scream the loudest. Bond yields will rise until the U.S. economy decelerates again. As a result, we recommend staying away from fixed income, currencies, and equities in countries with large current account deficits. Bonds, even in the U.S., are fundamentally mispriced from a long-term view. Negative real returns cannot last for long. Apple’s recent bond offering may be the poster child for the top of the bond market. On April 30, the company issued over $17 billion worth of bonds in six tranches with a weighted average coupon of 1.8% and a weighted average duration of ten years. Presently, the 30-year bond sells at just over 88 with a coupon of 3.85%. The loss experienced in just two months nearly equals four annual coupon payments. The ten-year tranche carried a coupon of 2.4% and is currently priced at 94; once again, nearly three years’ worth of coupon payments before the buyer is back to even. Bonds were great for 30 years but “traveling was much better than arriving” as Felix Zulauf recently wrote. The great rotation out of bonds has begun. The beneficiaries will be cash, property, and equities as suggested by the Standard Life Forecast in Figure 1. We are moving from a world of risk free returns to return free risks. Some systems — those with current account surplus markets and the U.S., because it has the privileged position of being the world’s reserve currency — will benefit relative to others. Equity markets in countries with current account surpluses should perform relatively well if these forecasts prove valid. But what happens to P/E ratios when real rates rise, volatility expands, and earnings growth, while positive, is less than in previous decades? These are the three forces that cause P/E ratios to expand or contract. The world we face has too little growth with a deflationary bias that contains default risk. In that environment, one is likely to find it difficult to grow earnings anywhere close to the rate of the past 20 years. The expansion of valuation multiples is just not in the cards for equities after their run up of the past 18 months, barring an unexpected acceleration in global economic growth. For further perspective, we turn to Jim Grant’s letter of June 14, 2013. Here, he points out that, in 1946, when long-dated Treasuries reached their lowest yield for what proved to be a generation, domestic non-financial debt amounted to 153% of American output. Today, domestic non-financial debt foots to 254% of American output. Moreover, in 1946, domestic financial debt was 1.3% of GDP. Today it equals 87% of GDP. Nevertheless, once the valuation adjustment effect from the past 18 months of QE is complete, equities will still be the investment of choice, particularly equities of global champions possessing managements with records of wise capital allocation decisions. These are companies with brand recognition that can be found in a myriad of industries. They have leading market share, healthy balance sheets and the ability to command an above market “rent” for products and services because of the resources placed behind the building of their brand over decades. Profit margins will not revert to the mean for these firms partially on account of the power of their brands but mostly because of the global scale built into their supply structure. The Law of Comparative Advantage really works, and these firms have capitalized on it for years. See Figures 7 and 8 respectively to see the power of this most important economic insight. Source: Corporate Reports, Empirical Research Partners Analysis. March 2013. 1Data smoothed on a trailing three-month basis. These global champions generate free cash flow year in and year out, have manageable debt, and pay dividends. Recall, dividends come in three forms — cash, share buybacks, and debt pay downs. And dividends grow because inherent in equities is protection from inflation and the ability to capture productivity gains embedded in rising earnings. Indeed, dividends will be the most consistent contributor to total equity returns over the next decade (See our book, Free Cash Flow and Shareholder Yield: New Priorities for the Global Investor). Other consequences of the “movie run backwards” include falling commodity prices. Lower highs and lower lows will plague commodity producers as global growth struggles and real interest rates drift higher. The U.S. dollar will plow ahead, so equity portfolios should be U.S. centric. The U.S. struggles to govern itself but favorable demographics, the shale oil revolution, a mobile labor force and a strong technology position will allow it to forge ahead. Household formations drive housing starts and that is a positive factor as well for the U.S. Housing prices may not rise as dramatically as in the past, but housing activity will increase and that will generate jobs. And of course, the U.S. dollar has the privileged position of being the world’s reserve currency. The U.S. economy is simply too powerful, too big, and too important to ignore. For these reasons, we believe an above average exposure to U.S. equity securities will be well rewarded over the next several quarters relative to other geographic equity markets. And try to enjoy the movie as it runs from back to front.